This week, CFBA is introducing Wildflowers of Terezin by Robert Elmer. I’ve read many books set in WWII - in fact, it's one of my favorite period settings. I don’t believe I’ve ever read any set in Denmark in WWII, so Wildflowers in Terezin was the same subject with a fresh face. Steffen Peterson is a Lutheran pastor who wants to stay safely behind his pulpit…and yet realizes he could help Denmark’s Jews escape Nazi law. Steffan does what he can, although clumsily, which leads to bigger consequences for the escapees…and him. When Hanne, the Jewish nurse he has begun to love, is sent to Terezin, a Nazi prison camp, to what lengths will he go to be reunited with her? I thought Wildflowers of Terezin was good. Good enough that I had to research Terezin myself when I was finished reading. 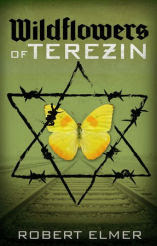 Although Wildflowers of Terezin is a work of fiction, the truth and actual events that took place during that time were successfully woven throughout the story. I was amazed that the Nazis took time to beautify a small section of Terezin for a short Red Cross visit – to prove to the world how well they were taking care of the Jews. How sad that so much of the world was deceived by Hitler’s hatred. Hanne Abrahamsen awoke with a start in the middle of a bad dream, something about being in nursing school once again and a man who looked like Adolf Hitler (but with the face of a codfish) announcing at her graduation that she was a Jew, and didn’t everyone already know that? The graduation had stopped, and she remembered wanting desperately to escape but not being able to move. Hanne had never thought much about dreams, or cared. Until now. Somewhere outside her window she heard what had awak- ened her: a line of cars and trucks roaring through the narrow streets of København, on their way to the devil’s business. And even louder at this time of the morning, when the only ones awake were the skrallemænd, emptying garbage. She shivered and pulled up the covers to her chin, but couldn’t put away the feeling that something was not right. It was not the first time she’d heard German vehicles at odd hours, so maybe it was just the dream. Still, she slipped out of bed to check the window that faced Tuborgvej. Of all the nurses’ apartments on the Bispebjerg Hospital campus, hers commanded the best, and sometimes the noisiest, view of the city. She shivered at the September predawn chill, reach- ing the window in time to peek through the heavy blackout shade and see a pair of brake lights flash as a vehicle careened around the corner. “Well, they’re in a hurry, aren’t they?” she mumbled, push- ing at the upper pane of her window to keep out the draft. A Dane? Not likely. No dansker would dare make so much noise at this time of the morning—especially not after all the troubles and tension they’d seen here in København over the past several months. After the strikes and all the troubles this past summer, no one wanted to make themselves a target. No,she’d heard German vehicles—and then another truck screeching around the corner confirmed what she’d feared. This one carried armed soldiers in back, holding on for dear life. This could only mean that the Germans had stepped up their campaigns against the Danish Underground—and that they were flexing their muscle in an early morning raid somewhere in the city. Hanne drew back as the little cuckoo on the wall of her kitchen sounded four . . . five . . . six times. But she stood there, shivering in her nightgown and bare feet, unable to move and unable to forget her dream—or the nightmare outside her window. Wolfschmidt frowned and checked his watch once more as he squeezed the backdoor handle. Was he the only one in this operation who cared about being punctual? It would take a Gestapo man’s attention to detail to make this work. His young driver from the schutzpolizei, the German Security Police, mumbled a weak apology and wiped a bead of sweat from his forehead as they squealed past the famous Round Tower, then careened around the corner and approached the Jewish synagogue on Krystalgade. Ahead and to the right, he could make out the large, blond- bricked building, rather square and squat despite a row of stained-glass windows running the length of the second floor level and a stepped roof even higher to the rear. Wolfschmidt thought it rather base looking and nowhere near as grand as a proper German cathedral, though that did not surprise him. A place of worship, indeed! “Yes, Herr Sturmbannführer,” replied the driver, using Wolfschmidt’s proper Gestapo title. At least he could do that correctly. But now Wolfschmidt grabbed the young man’s shoulder to get his attention and to go over their instructions yet one more time. Despite the utter routine of their action this morning, Wolfschmidt couldn’t help feeling his heart pounding in his ears. He was made for this work. “I understand.” The driver shut off the car’s ignition and waited.The good news was that if they needed to, Wolfschmidt was confident this large young man had the required beef to make his way through any door they needed, locked or otherwise. Much more so than Wolfschmidt himself, who was slight of build and might break his shoulder if he attempted such heroics. Again the driver nodded. How hard could this be? But by now they were almost five minutes off schedule, and Wolfschmidt could feel his anxiety rising as he pushed open his door and stepped out into the cool September air. No more delays. No more foolishness. He straightened his high-peaked gray hat where it perched on his precisely short-cropped blond hair, then checked to be sure his matching gray trousers still held a crease after his short ride. Why was it so hard to find anyone in København who knew how to properly clean and press his uniform? Soon that would change, however, once this war was won and a more full measure of the Reich’s efficiency found its way to this city. Or they could simply flatten it and start over. In his opinion that might prove to be the more efficient solution. Frankly, he didn’t care either way. “After you.” Wolfschmidt waved for the young man to lead the way through the gate. Happily it swung open with hardly a complaint, though he had to say that didn’t surprise him, either. These Danes had no sense of how to secure their buildings. They would be content, he imagined, to remain fat and protected by Germany, enjoying their cheese and beer and sending the best of their own produce to help keep the German army well-fed. In this way they could at least be useful, even if too many of them did not appreciate the advantage such an arrangement posed to their wealth and security. What did the Danes know of that? Three steps up from the outer gate, the building’s large oak outer door swung open just as easily. This was going to be too simple. Checking his own pistol, Wolfschmidt stepped in behind the driver as they entered a high-ceilinged foyer. It smelled of ancient, institutional dust in the way of most such buildings, which gave him even more reason to despise the place. He stepped on the driver’s heel to hurry him along. Beyond the red-carpeted foyer a set of double doors with small glass windows opened into the synagogue’s main auditorium, an expansive room with lofty ceilings and a horseshoe-shaped balcony level all around the back. This could make a fine movie theater, he thought, and made a mental note of it. But right now he focused on the task at hand, which would lead the way for a more sensible use of the building. Up in front, a cluster of twenty or thirty men had gathered for their Friday morning prayer service, dressed in the peculiar head garb that left no doubt of their religion. Wolfschmidt had not come to pray. Despite his revulsion at being found in such a place, he straightened his back and coolly strode to where a robed, bearded man stood before the group. This would be the rabbi. And by this time they had stopped their prayer, or whatever Jewish thing they were doing, and all stared wide-eyed at the remarkable impertinence of Wolfschmidt and his assistant. “Josef Fischer will accompany us immediately.” Wolfschmidt interrupted the rabbi. He naturally had no time for nonsense or small talk, even if he had been so inclined. To emphasize his commands he made a point of moving a hand to his holster, making certain they all noticed. They would understand his meaning, if not his German. He needn’t have worried. A pink-faced little man in the front row stepped out after an uncomfortable silence, gently pushing aside the hand of a friend who halfheartedly tried to hold him back. “Ich bin Fischer,” said the man, who adjusted a pair of round spectacles and stepped up to face them. He ignored the whispered warnings of his nearby friends, which Wolfschmidt counted for blind stupidity. So this was the man they’d gone to all this trouble to apprehend? He might have respected a little more defiance, just for sport, even though this man stood a full foot shorter than himself. But never mind. They would all face the same fate, sooner rather than later. This Josef Fischer could appear brave as much as he wanted to, for all the sturmbannführer cared. He signaled with a nod so that his assistant grabbed Fischer by the back of the collar and guided him roughly back up the aisle toward the exit. The man’s tasseled prayer shawl fell at Wolfschmidt’s feet, but when the Jew bent to pick it up Wolfschmidt couldn’t resist holding it to the floor with the toe of his boot. Wolfschmidt would have gladly taken on this man, here and now, had it not been for his specific orders and the even more specific task at hand. But with a deliberate motion he picked up the shawl and quite deliberately tore it in two. The ripping sound pleased him, even more as he watched the expressions on the men’s faces turn from fright to horror. Without another word of explanation he turned on his heel to follow his assistant and their charge out to the waiting car. Fifteen minutes later Sturmbannführer Wolfschmidt stood with arms crossed in the middle of the Jewish Community Center offices on Ny Kongensgade, New King’s Street. Surely it didn’t need to take this long to find a simple file of addresses? And this librarian—Fischer—worse than useless. They could have easily broken down the front door, and never mind the keys which the little man now held in his trembling hands as he watched five uniformed schutzpolizei taking apart his office, file by useless file. “It’s not in this one, either,” reported one of the polizei, tossing another file drawer into the middle of the room. Still the librarian trembled. Fischer looked to be in pain as he closed his eyes and mouthed . . . what, a prayer? Little good it did him now, because a moment later one of the schutzpolizei let out a cry as he pried open a locked metal file cabinet with a crowbar. “I think I found something!” said the young man. Fischer winced but said nothing as they poured out the contents of the drawer, and then another—hundreds upon hundreds of cards, each one neatly printed with a name and address. Wolfschmidt smiled and stepped over to pick one up. By this time the schutzpolizei had dumped the contents of several drawers on the floor. Which was all very well, but now they would just have to gather them all up and cart them away. All of them, yes. The name and address of every Jew in this little country—and that would constitute close to seven thousand names. Perhaps that didn’t amount to much, com- pared to populations in other countries they had liberated. But it was enough to make their job much easier when the time came. And that, he knew, would be very soon. Many thanks to Robert, Abingdon Press, and CFBA for sending me Wildflowers of Terezin to read and review!